It’s Pay It Forward Time . 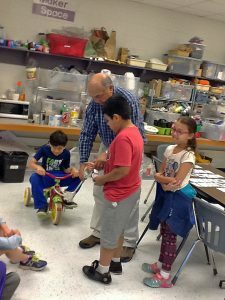 . .
Charles helps students set up the “wheel and axle” experiment, using his granddaughter’s tricycle. A former aerospace engineer, I worked for 33 years as an Air Force officer and 13 years for SAIC as a system test planner for the National Missile defense program. I retired in 2009. I had done other kinds of volunteer work over the years, but when I ran across a RESET recruitment ad in The Washington Post, I was instantly intrigued. After chatting with Executive Director John Meagher, I liked what I heard about the program. I felt RESET’s investment was well focused and that it did a great job of fostering an exchange of ideas and in providing resources and STEM curriculum support for schools in the DC area. RESET’s work is so critical for our country’s future. We will always need highly trained scientists and engineers to solve complex technical, health, and engineering problems. 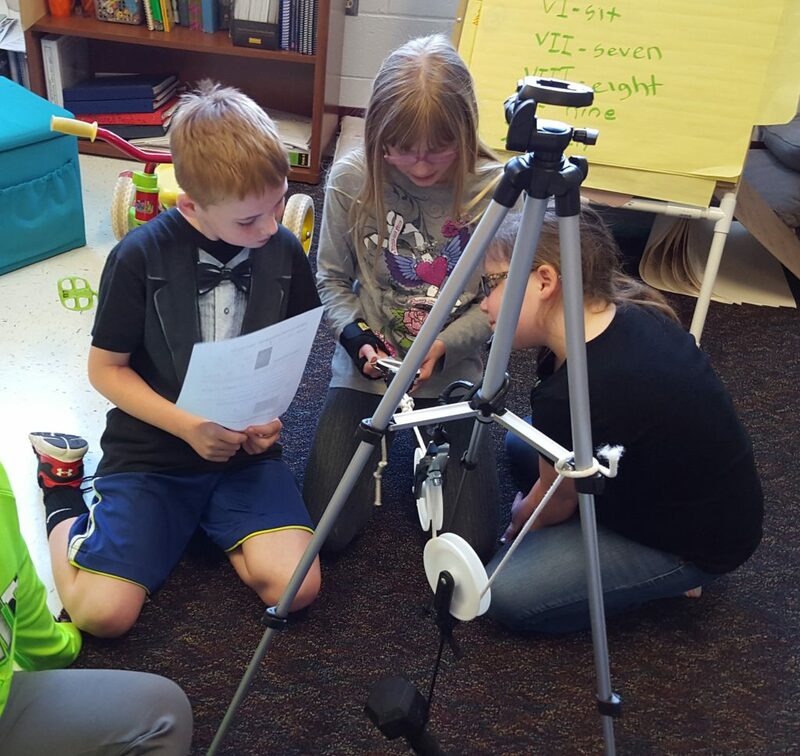 When I first started with RESET, I volunteered at Moorefield Station Elementary School. At the time, I had also been doing a lot of local charity golf tournaments. One of the charities we supported was Sugarland Elementary School, a low-income school, located in Loudoun County. I went home and did a little research on schools in the area. I checked out some government sources on scholastic performance and discovered that Sugarland—a Title 1 school—was one of the lowest performing schools in the county. Sugarland is not an affluent school, so it can be challenging for them to compete in a high-income county like Loudoun. Having come from a low-income background myself, I felt a strong pull towards bringing RESET programs to these students. I contacted John and offered to expand my volunteer work to Sugarland. John very quickly set up a meeting with school officials. 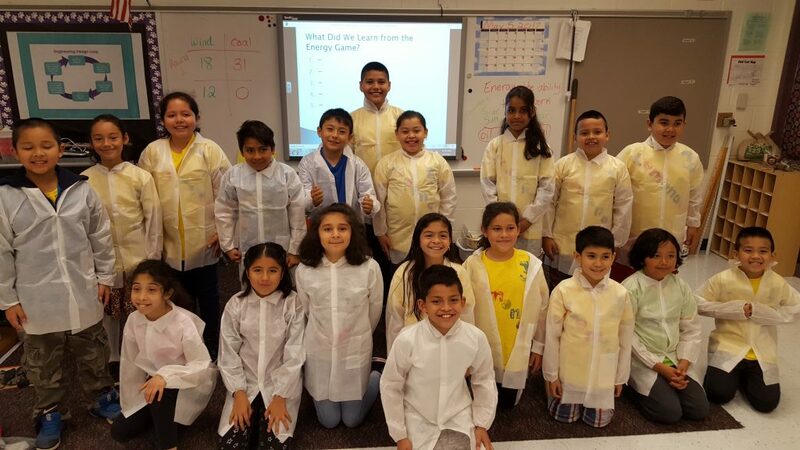 They accepted our help and we will soon complete our first school year there, leading RESET programs for a diverse student body that includes many Hispanic students. Now, I volunteer at both schools, working mostly with third-graders. I was fortunate to have had several adults in my life who believed in me and encouraged me. That’s why I was so eager to work with students from less advantaged backgrounds. I thought, “Now it’s time to give something back.” From personal experience I know it just takes one spark to ignite an interest and a passion for science, one that can grow into a future career and life path. My own inspiration came from two sources: As a child in the 1950s, I used to watch Walt Disney TV programs about the challenges of breaking into outer space. This, along with the national alarm after the Soviet Union launched the world’s first satellite, Sputnik, motivated me towards a science or engineering career. My experiences with my students have been wonderful. The one thing I am always delighted and amazed to discover is how bright and precocious they are. Young minds are naturally curious and open, no matter where they come from or how much they have. They are limited only by resources and opportunity. And some classroom experiences are definitely more memorable than others. For example, during one session with my third graders, I intended to demonstrate the pull of the moon’s gravity on the oceans using a balloon filled with water. Typically, the normally spherical balloon would be pulled out of shape by the force of gravity, thus illustrating my point. I’ve performed this demo many times, but this time I allowed a student to hold the water-filled balloon by the top end. Unexpectedly, he bounced the balloon up and down. Not surprisingly, it burst, dousing him, me, and the floor with water (and there may have been some additional collateral damage). We all had a good laugh and achieved a much better appreciation of the force of gravity than if the experiment had gone off without a hitch.